Back in March, I analyzed the productivity ‘surge’ of 2007-2009 and declared it “highly suspect.” (It was perhaps one of the longest blog posts ever). Well, yes. As I predicted five months ago, reality has won, and productivity growth has been revised down. This morning’s productivity release revised down nonfarm productivity growth in the 2007-2009 period from 2.3% to 1.5%. *The bad news is that the U.S. economy is worse off than it looks, even now. * The ‘not-so-bad news’, at least for Americans, is that the next round of the financial crisis is likely to hit the rest of the world harder than the U.S. , even if the government does nothing. This is a long post, but not epic. The reason is U.S. workers have become so productive that it’s harder for anyone without a job to get one. Companies are producing and profiting more than when the recession began, despite fewer workers. They’re hiring again, but not fast enough to replace most of the 7.5 million jobs lost since the recession began. According to the conventional wisdom, as summarized by Wiseman, the U.S. has sailed through the crisis in better shape than our industrialized rivals. The conventional wisdom also says to the degree that we have a jobs problem, it’s because we are so good at boosting output and productivity. Of course, this directly contradicts my recent post, where I argued that the apparent productivity gain from 2007-2009 was to a large extent the result of mismeasurement. But now let me make a different point. Wiseman argues that companies are producing more than when the recession began. I don’t think he’s right for most of manufacturing. 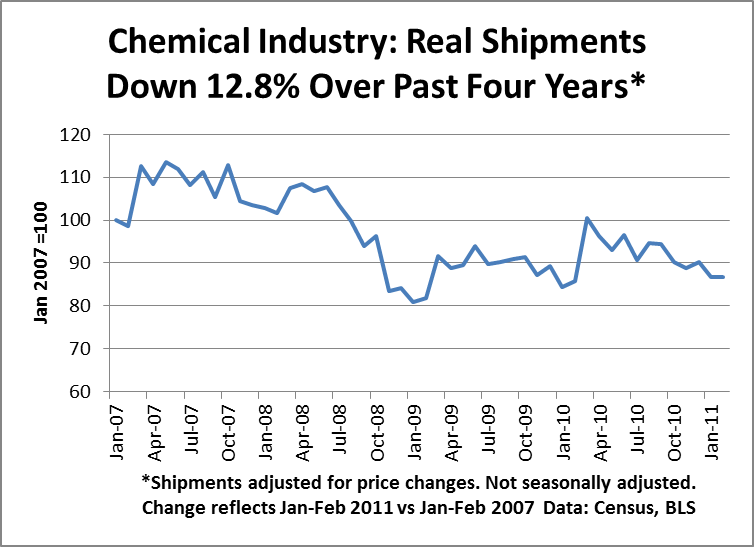 I’m going to show a series of charts for various manufacturing industries. 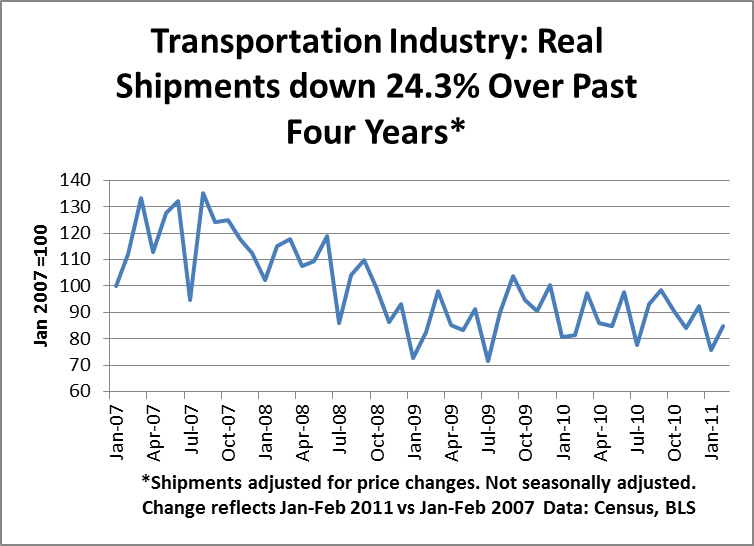 These charts show shipments, adjusted for prices changes–‘real’ shipments. Real shipments are a good measure of what actually comes out of the factory. Karl Smith writes In Which I Disagree With Almost Every Word Mike Mandel Says . It’s a long post (though not nearly as long as mine), and I just wanted to reply to two points. The only way to get GDP wrong is either to miscount the number of goods and services sold in the US or to misestimate the price index of final goods – not intermediate goods. Um, no. This statement is simply wrong. gross domestic product = exports + gross domestic purchases – imports. 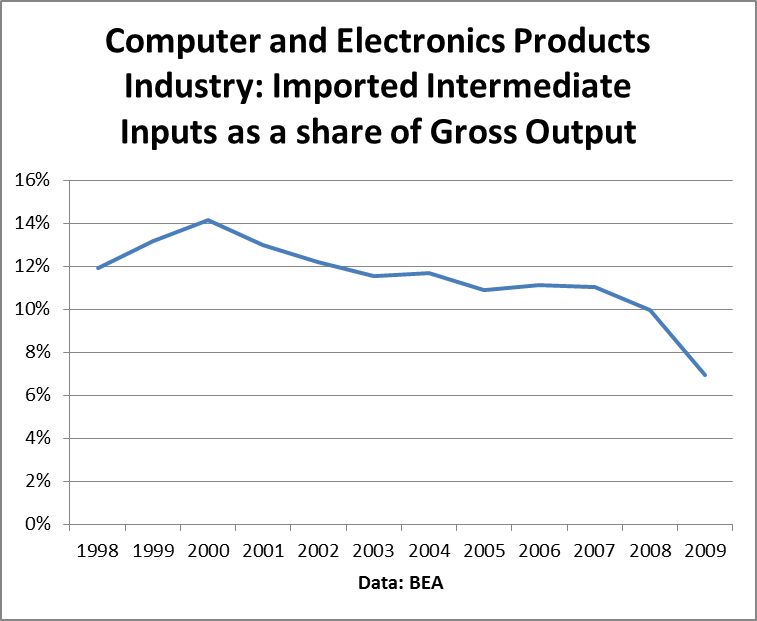 Imports, as it turns, out, include a lot of imported intermediate inputs ( according to this piece in the February 2011 Survey of Current Business, “BEA estimates that about 40 percent of imported commodities are used as intermediate inputs by businesses”). So that getting the price index wrong for imported intermediate inputs slides right into GDP. More fundamentally, remember that GDP is a value-added measure. However, the fundamental unit of observation for the BEA each quarter is revenues/shipments for various industries, which is a gross output measure. Then the BEA has the herculean task–which I never fully appreciated before–of figuring out how much of each industry’s revenues is final product, and how much is intermediate input. A simple example: Each month the revenues of law firms are reported each quarter by the Census Bureau. Part of those revenues are final product (personal consumption of legal services), and part are intermediate inputs (legal services to business). Taking the real growth rate of observed revenues as given, any error in estimating the real growth rate of intermediate inputs of legal services will translate directly into an error in estimating the real growth rate of personal consumption of legal services. This sort of error does not wash out in final GDP. Consider the related question of whether R&D should be treated as business investment or as intermediate inputs. Currently, R&D is treated as an intermediate input, but the BEA has calculated that treating R&D as investment would boost real GDP growth. The question is an important one: Is a ‘terms-of-trade’ productivity improvement equivalent to a ‘domestic’ productivity improvement? Here I’m going to cheat: The short answer is that I’m about to finish a theoretical paper showing the specific sense in which they are not equivalent. But you will have to wait a couple of weeks for that one…I kind of overdid the last post. How much of the productivity surge of 2007-2009 was real? In the 2007-2009 period, the U.S. economy experienced its worst recession since the Great Depression. Nevertheless, despite this deep downturn, the near-collapse of the financial system and unprecedented global economic turmoil, U.S. productivity growth actually seemed to accelerate in the 2007-2009 period, or at least maintain its previous pace. The 2007-2009 productivity gain had a major impact on both economic policy and political discourse. First, it gave the Fed a free hand to feed mammoth amounts of liquidity into the system without worrying about inflation. Second, it convinced the economists of the Obama Administration that the economy was basically sound, and that the big problem was a demand shortfall. That’s why they expected things to get back to normal after the fiscal stimulus. However, I’m going to show in this post that the productivity gain of 2007-2009 is highly suspect. 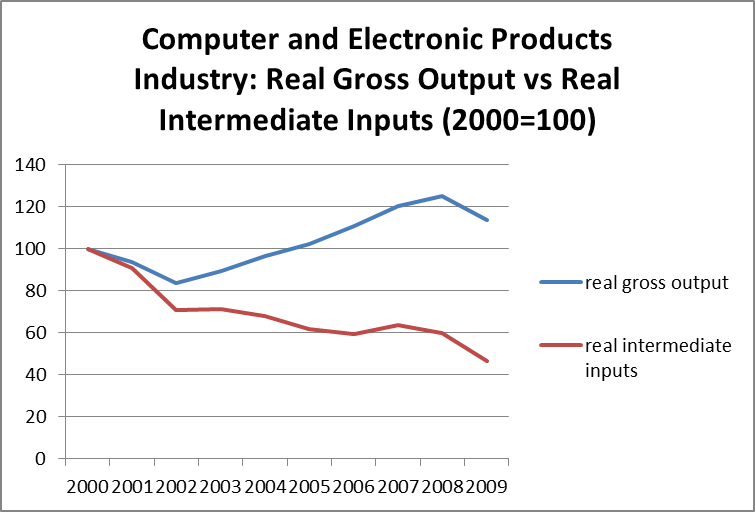 Using BEA statistics, I identify the industries that contributed the most to the apparent productivity gain, including primary metals, mining, agriculture, and computers and electronic products. Then I analyze these high-productivity growth industries in detail using physical measures such as barrels of oil and tons of steel. I conclude these ‘high-productivity’ industries did not deliver the gains that the official numbers show. Based on my analysis, I estimate that the actual productivity gains in 2007-2009 may have been very close to zero. In addition, the drop in real GDP in this period was probably significantly larger than the numbers showed. I then explore some implications for economic policy. I start by giving several data points. *From 2007 to 2009, business productivity rose at a 2.4% rate, according to the official data. By comparison, the productivity growth rate was only 1.2% over the previous two years (2005-2007). *If you like your numbers quarterly, business productivity grew at a 1.8% annual rate from the peak in 07IV to the trough in 09II. That’s somewhat faster than the 1.6% growth rate of the previous 3 years. *Looking at total economy productivity–real GDP divided by full-time equivalents (FTE)–we see that productivity growth in 2007-2009, at 1.6% per year, was double that of the previous two years (0.8% per year). 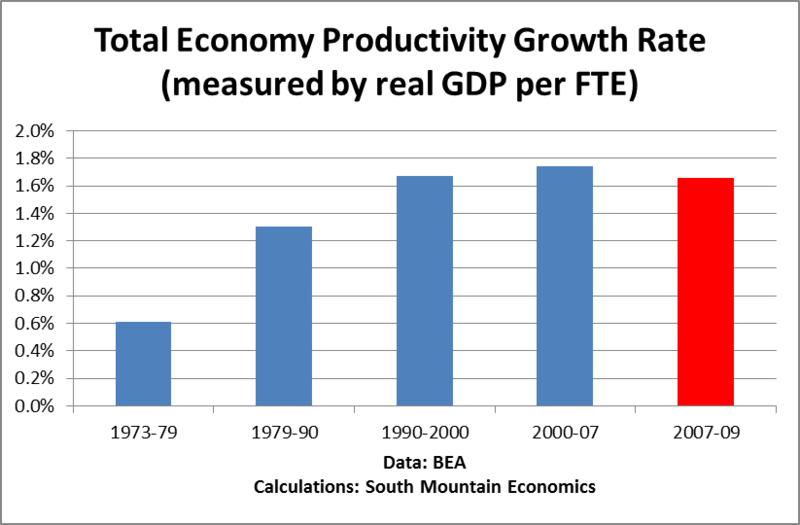 This chart breaks down productivity growth by business cycle, using the official statistics. You can see that the productivity growth of the 2007-2009 period–the worst recession in 70 years–appeared to be basically a continuation of the productivity gains during the boom. You can’t tell from this chart that anything bad happened to the economy. The strong measured productivity growth during the crisis years reflects a steep drop in employment (-5.7%) combined with an apparently mild two-year decline in real GDP (-2.6%). Of course, ‘apparently mild’ is still nastier than any post-war U.S. recession, but a 2.6% decline in real GDP translates into a 4.4% decline in per capita GDP, which puts the U.S. at the low end of financial crises described by Reinhart and Rogoff. What’s more, the 2007-2009 productivity gain had a major impact on both economic policy and political discourse. First, it gave the Fed a free hand to feed mammoth amounts of liquidity into the system without worrying about inflation. Second, the productivity gains convinced the economists of the Obama Administration that the economy was basically sound and there was nothing wrong with the ‘supply-side of the economy. Instead, the Obama Administration concluded that the big problem was a demand shortfall, which is why they expected things to get back to normal after the fiscal stimulus. In short, in my view the overwhelming weight of the evidence is that the current very high — and very disturbing — levels of overall and long-term unemployment are not a separate, structural problem, but largely a cyclical one. It reflects the fact that we are still feeling the effects of the collapse of demand caused by the crisis. Indeed, at one point I had tentatively titled my talk “It’s Aggregate Demand, Stupid”; but my chief of staff suggested that I find something a tad more dignified. If productivity was rising, then the job loss was due to a demand shortfall and could be dealt with by stimulating aggregate demand. That, in turn, helps explain why the “job problem” didn’t seem so urgent to the Obama administration, and why they spent more time on other policy issues such as healthcare and regulation. I’ve been busy putting together a new paper titled “Implausible Numbers: How our current measures of economic competitiveness are misleading us and why we need new ones” It’s accompanied by a Competitiveness chartbook. The two should be read together. These are draft work-in-progress, so I’d be very interested in getting comments. I like Michael Lewis. I’m envious of his writing and reporting skills–and I really learned a lot from The Big Short. At the bottom of the success of the Irish there remains, even now, some mystery. “It appeared like a miraculous beast materializing in a forest clearing,” writes the pre-eminent Irish historian R. F. Foster, “and economists are still not entirely sure why.” Not knowing why they were so suddenly so successful, the Irish can perhaps be forgiven for not knowing exactly how successful they were meant to be. They had gone from being abnormally poor to being abnormally rich, without pausing to experience normality. Lewis accepts that Ireland went from poor to rich, and then proceeded to fumble it away. But what if Ireland was never really as rich as it seemed? What if the statistics that said “rich” were wrong? Maybe the real problem came earlier. Let’s start by looking at the numbers. Remember that Ireland was called the “Celtic Tiger’ because it grew so fast in the 1990s. 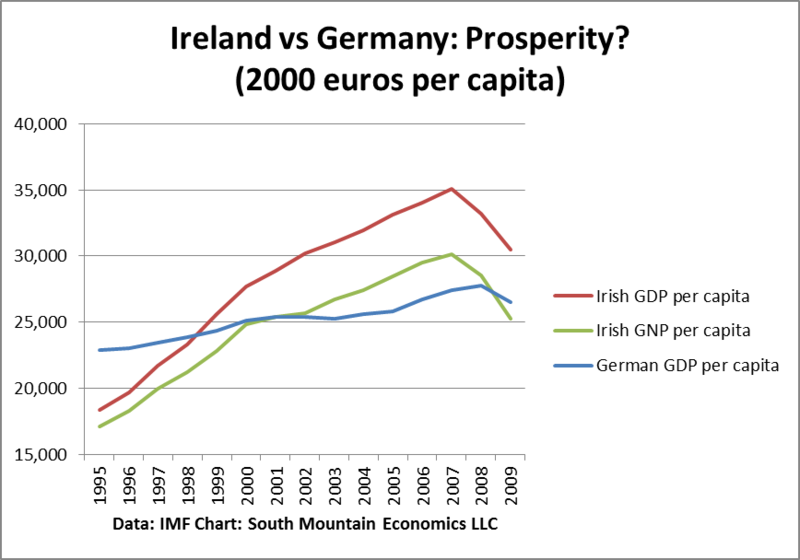 The chart below has three lines– per capita real GDP in Ireland, per capita real GNP in Ireland, and per capita real GDP in Germany (a certifiably real economy that makes things). Per capita real GNP subtracts out the net income flow of profits out of Ireland–that makes a big difference because of Ireland’s role as a pharma and electronics production hub by multinationals. The salient fact is that according to the official stats, Ireland’s real per capita income appeared to reach Germany’s level around 2000, before the construction boom started. (Construction was important to the economy in 2000, but not dominant like it was later in the decade. Home completions in Ireland totalled around 50,000 in 2000, compared to 93,000 in 2006). That’s really an astonishing run-up. In 1995, Ireland’s per capita income was 25% less than Germany’s. By 2000 Ireland had made up the gap. Truly a Celtic Tiger not to be trifled with. Now, let’s stop here. As regular readers of this blog know, I’m very concerned that the conventional economic statistics are systematically mismeasuring national output, because of problems handling trade. 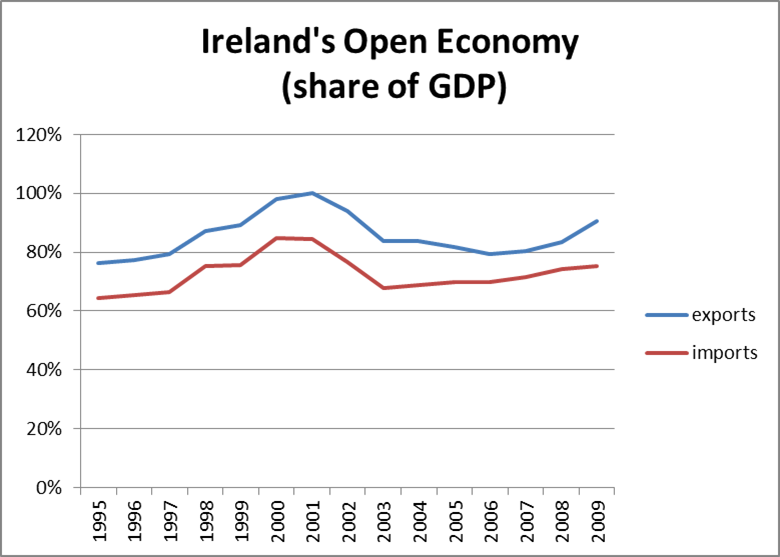 Ireland happens to be one of the most open economies in the developed world. In fact, exports in magnitude are almost as large as GDP, with imports not far behind. (I don’t know who has a more open economy…but it isn’t China). With exports and imports so large, it only makes sense that changes in exports and imports actually drive growth in Ireland. In fact, everything else–including capital invesment in things like homes–is really a secondary source of growth. 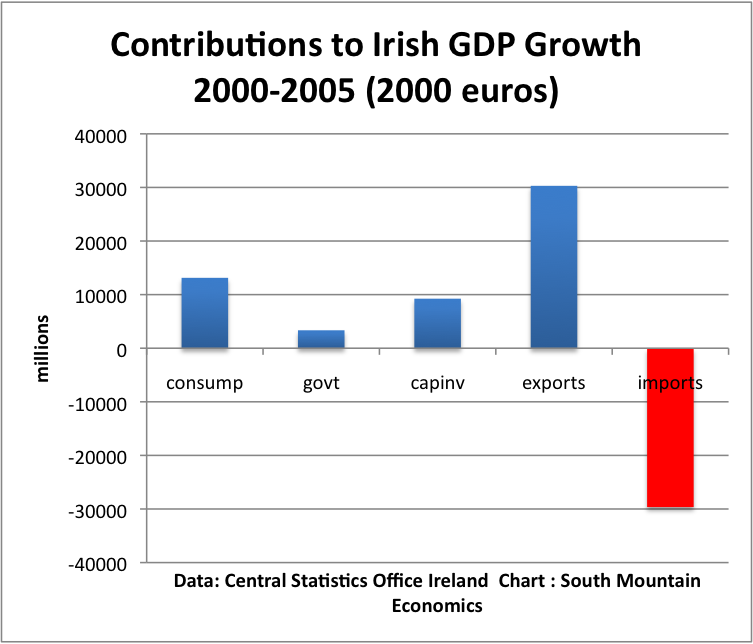 So I used the data from the Central Statistics Office in Ireland to calculate the contribution of exports and imports to growth. First I started with the supposed period of strong growth, 1995-2000. You can see that the positive contribution of exports and the negative contribution of imports is enormous. Here is a similar chart for the 2000-2005 boom period. Note that exports and imports are still relatively huge, even during the construction boom. The implication–and you knew I’d get to the implication someday–is that in Ireland, in particular, relative small mismeasurement errors in real exports and/or imports can have outsized effects. So this Celtic Tiger may have been a Celtic Kitten instead. And the shift from real boom to fake boom may not have been as abrupt as it seemed.